We normally can’t get through our commute without busting a move to Bruno Mars’ music, but this morning in particular we can’t stop bopping because Bruno Mars’ Carpool Karaoke is here and it’s so darn funky. It was previously teased that Mr Mars would be taking part in James Corden’s popular singing segment, and the preview for the clip was so epic that we basically couldn’t wait. 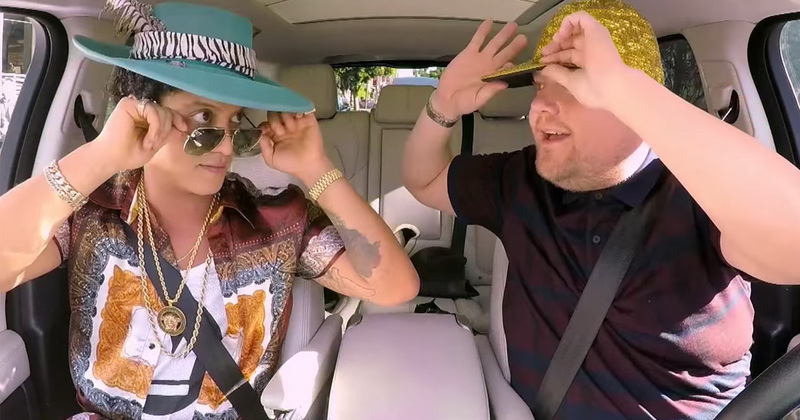 Mars, who recently released his new album 24k Magic, joins the likes of pop icon Madonna, princess of pop Britney Spears, and hat wielding superstar Lady Gaga, who have all joined Corden in his car to drive around while singing to their biggest hits. However, while Madonna was WILD, Gaga got emotional, and Britney was kinda shy, Bruno Mars served up more soul and funk than we were anticipating. What’s more, he was obviously totally loving showing off his smooth side with James Corden. The pair made their way through Bruno’s funkadelic discography, performing songs like new single “24K Magic,” “Locked Out Of Heaven,” “Grenade,” “Versace On The Floor,” and, of course, the irresistible “Uptown Funk,” which is where both Bruno and James bust out their best dance moves (well, the best you can do while you’re sitting in a car driving around L.A.). In fact, Bruno got so into that he turned his energy on to James with a rather dangerous looking fist hitting move. Watch Bruno Mars’ full Carpool Karaoke below. Okay, it’s now 100% our dream to drive around with Bruno Mars! While that’s unlikely to occur, however, Mars did announce a HUGE world tour in support of his latest record 24k Magic. Tickets for the tour are available now. Now, if you’ll excuse us we’ll be off to bust some dance moves to Bruno Mars’ Carpool Karaoke.